The Syrian army fired missiles at Israeli jets on Friday after several airstrikes inside Syrian territory. 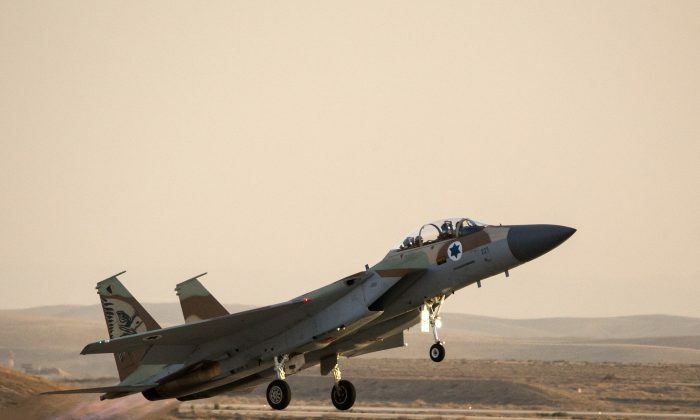 Israel said that a missile was fired at its jet but was intercepted, marking the most serious incident involving the two countries since the start of the Syrian civil war in 2011. The Syrian army high command claimed the jet was struck over Palmyra by an anti-aircraft missile after it flew back to Israel-controlled territory. The plane was one of four that “penetrated our air space at 2.40am (12.30 GMT) via Lebanese territory,” Syrian officials claimed. Israel denied Syria’s claims, the Jerusalem Post reported. As anti-aircraft missiles were fired from Syria, sirens were heard in the Jordan Valley. The intercepted missile was taken down by Israel’s Arrow system, and the remains of the projectile landed in a village on the outskirts of Irbid in northern Jordan. Syria’s SANA state news agency claimed Israel’s “act of aggression came as part of the Zionist enemy’s persistence with supporting ISIS terrorist gangs and in a desperate attempt to raise their deteriorating morale.” It added that the Israeli warplanes flew into Syria via Lebanon and targeted a military position in central Syria. Israel is believed to have carried out strikes against Hezbollah weapons convoys in Syria, but it rarely makes public comments on them.